So many times, I hear the usual sort consistently whine about how there is no “authentic” food in Oklahoma City. If you mean overpriced maladies in upscale districts, then no, you’re probably not going to find it. And, to be fair, it’s seemingly rare even in plenty of mom-and-pop joints around town, at least in the truest sense of the word. Over the past few years, however, I’ve learned that if you want not only authentic food but wholly authentic friendships as well, you need to shake the hand of a man you normally wouldn’t. Whether they’re an immigrant from Africa, Iraq or, hell, even Mexico, the foreign friendships you make will last a lifetime and, at the very least, an extremely “authentic” lunchtime. No walls, only bridges. Let me introduce my friend Alassane. He’s from Burkina Faso, located in Western Africa. He came to this country to be someone in the medical field, and though it was plenty of long days and longer nights, he’s almost there, putting in the hours at a local hospital’s ICU ward while taking care of a loving wife and a couple of precocious children. And, additionally, I feel I’ve almost got him talked into moving back to Africa where together we’ll open up Burkina Faso’s first taqueria, but that’s another story. But, even more than all that, Alassane is a world-class talent in—and especially out of—the kitchen, focusing on Burkinabé cuisine, specializing in maize, yams, okra and so on, as well as plenty of unnerving proteins. The first time I had one of his dishes, it was an African dish called shitoumou. Ostensibly a stew-like meal made from the crushed bodies of these local—Burkina Faso local, that is—caterpillars that are seasoned with a special spice that Alassane always seems to have on him. Ask him for some if you see him. 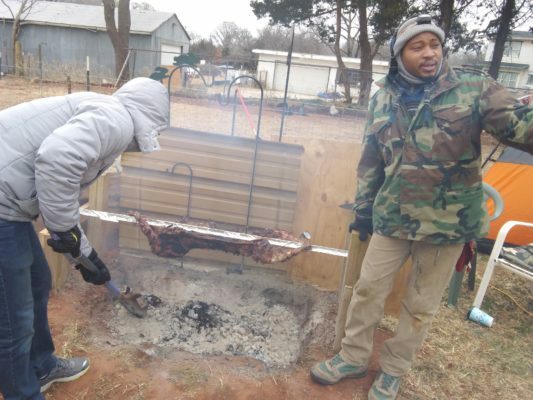 For the New Year though, he took Burkinabé cuisine in Oklahoma to another level—an exceedingly “authentic” level, if you will—wherein he bought, butchered and prepared a goat according to the way he was taught growing up in Africa. A full day’s worth of preparation, Alassane and a couple of friends hijacked a decent Del City country estate and dug a small fire-pit in the backyard, stoking the flames as the night went on, coating their clothes with the slight dusting of heavy smoke. 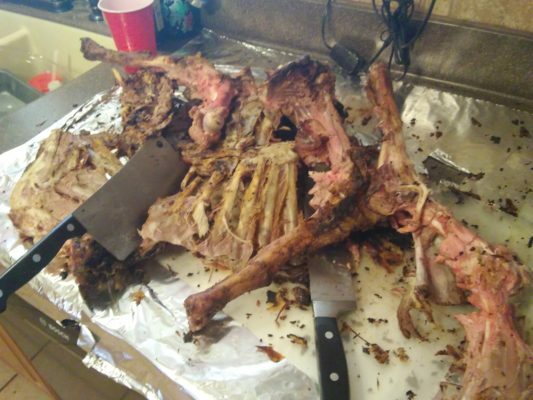 Proudly slayed and ready for the spit, the goat’s head was removed—more on that in a minute—and the carcass was heavily seasoned and placed on the fire, rotating in the bitter cold for what seemed like hours and hours. The souhia, as it’s called, took a plenty of hard work and definite dedication, but it’s the type of wherewithal you won’t find in some Midtown restaurant, no matter how “real” they claim to be. Juices dripping sensually down the repentant goat’s blackening body, he took out a large knife and cut off a piece of crispy flesh for me to try and, like a true nature’s son, it melted down immediately, a wondrous sensation to be a part of. The bubbling moisture dripped on the flames from the torso, taunting them to rise higher and higher—the slight crackle and definite pop was sweet soul music to my ears. The souhia was done in the early afternoon the next day. 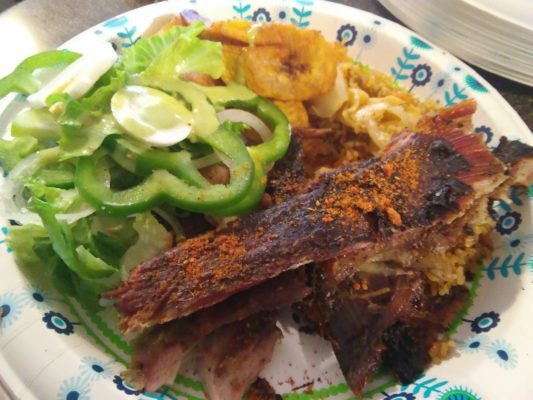 Taken into the kitchen to be judiciously carved, a moderate slab was portioned off for me and plated with some cheboudjen—a special green rice—as well as a side-salad with green peppers and onions, with some expertly fried plantains to taste. With a skin that was covered in Alassane’s secret spices, it lead with a jerky-like texture that made you work for the lean meat underneath, which had a wonderfully gaminess; with a beautifully moist taste all its own, the delicious rituals of dining commenced, wiping greasy hands down the front of our shirts while imbibing on this tangible taste sensation. 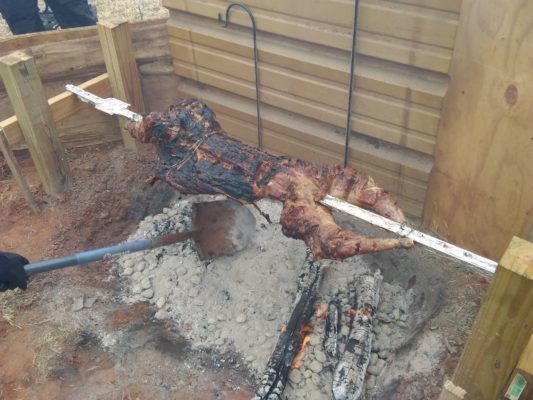 The aforementioned goat’s head, long missing from the main meal, had apparently been put in an old pot and left to boil, simmering on the open fire all morning. 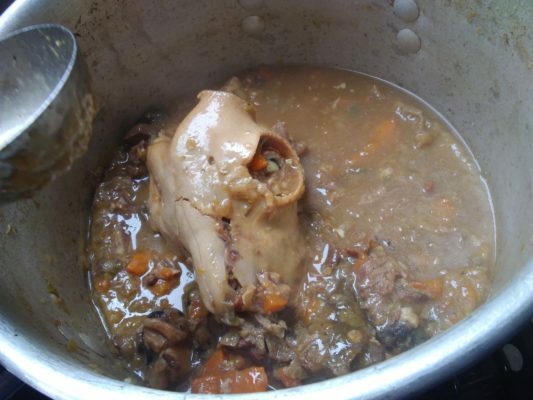 What Mick Jagger would possibly call goat’s head soup, they call it zougousoup in Burkina Faso; with the tender facial meat sloughed off and drowning in various depths of vegetables such as carrots and onions, it made for a rich broth, itself made with even richer meat. For those willing to partake, the soup was absolutely dining with Mr. D…elicious. As the party began to thin and most started to retire back to the cold grey dystopia that waited outside the estate’s gates, Alassane called me over, having saved a special part to share: the soupe de cerveau, or the eyes and, especially, brains of the young goat. What I considered almost a badge of honor, I watched covetously as he cracked the well-cooked skull with a comically large cleaver; the brains exposed themselves proudly, looking almost like a cottony little ball but with a slightly metallic taste. The fat eyeballs though were a gooey mass of deliciousness that truly tastes like nothing you’ve had before unless, of course, it’s been eyeballs. Wiping my mouth, I smiled when I realized how I enjoyed not only the “authentic” nature of the food that was served, but of the absolute friendship that has sparked up because of it; Alassane is so much more just than a guide to his country’s eats …he’s a hilarious storyteller, a spiritual leader, a strong shoulder, an optimistic soul and, best of all, a person to honestly look up, a worthy man that truly embodies the American dream as it’s supposed to be. So the next time when you’re complaining about the lack of “authentic” food in the culinary designs of Oklahoma City and beyond, take a step back and instead lament the lack of divergent personages from far and away in your life–friendships that should be and lasting bonds that could be. Cómpralo ya! Follow Louis on Twitter at @LouisFowler and Instagram at @louisfowler78. Awesome! Most of us miss so much in our insulated white-bread culture. One of the best and most memorable meals of my life was in a Vietnamese restaurant… in Vietnam! The party was two of us GIs, plus about a dozen locals with whom we worked. I’ll never forget the sight of that young lady biting the head off a roasted sparrow. The spit looks like a metal fence post for barbed wire. Why not? Louis, how did you meet Alassane? Was it in the course of your medical adventures of 2018? Great story! It helps me to justify that I too like to try different foods, if only vicariously. You lost me at brain and eyes. I know, I know. Tried some goat once… not a fan. Goat is actually pretty good! But that is about the scrawniest-looking goat I’ve ever seen! Every summer for years friends would throw a 3 day lake blast that included a Bud beer truck with taps on the sides, copious amounts of a green leafy substance, and a huge BBQ pit. They cooked one pig and two goats, and those were truely massive animals! A bicycle-powered spit would hold two at a time. Taking a couple of hours turns on the bike insured you a place at the front of the chow line. With large amounts of potato salad and pots of baked beans nobody went hungry! The kids these days don’t know what they missed! We lived in the West Indies for a while. Goatwater was great — except they cut the bones with a saw that left the sharp, knife-like ends sticking out. Still awesome. Lake Hefner called…hope the young doctor-in-training is good at pushing a lawn mower because somebody’s gotta fill the void he left. Chuckling at the notion that cooking a goat in a backyard requires more “hard work and wherewithal” than turning over every table in a restaurant 4 times on a busy Friday night. Where can we try his food?? Here in Tulsa, we replace the goat with pygmy. I’ve eaten goat in a Mexican food place in Houston. Cabrito. Pretty tasty but that was several years ago; tastes change.